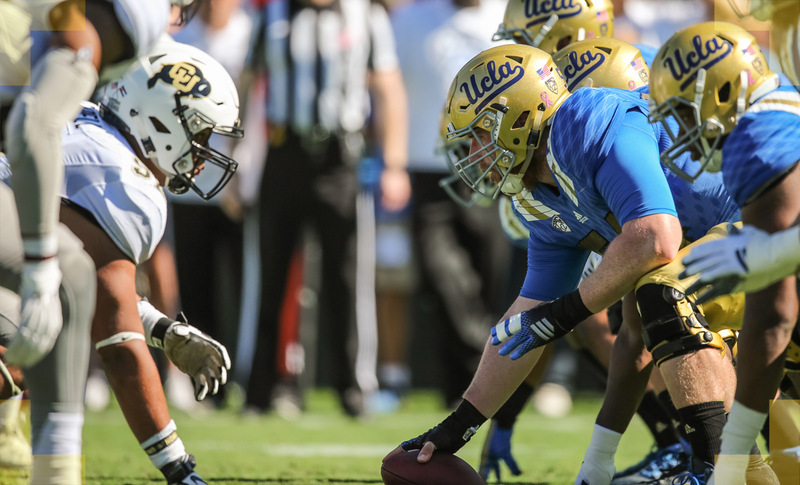 Last weekend I had an opportunity to photograph a football game at the Rose Bowl between the Colorado Buffaloes and the UCLA Bruins. 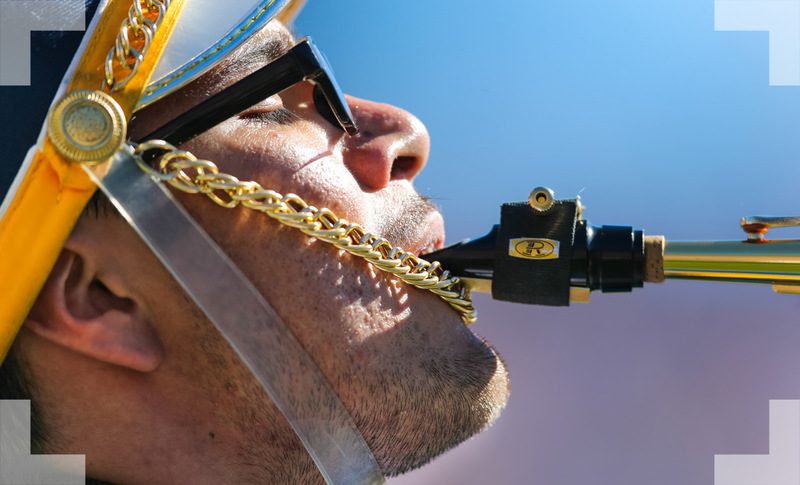 It was a hot one out there in Pasadena, and instead of carrying only one camera/lens combo like I did last time at USC, I brought two: A Canon 1DX with a 600mm F/4, and my Nikon D3s with a 70-200 2.8. I later switched to a wide 17-35 f/2.8 for the post game stuff. 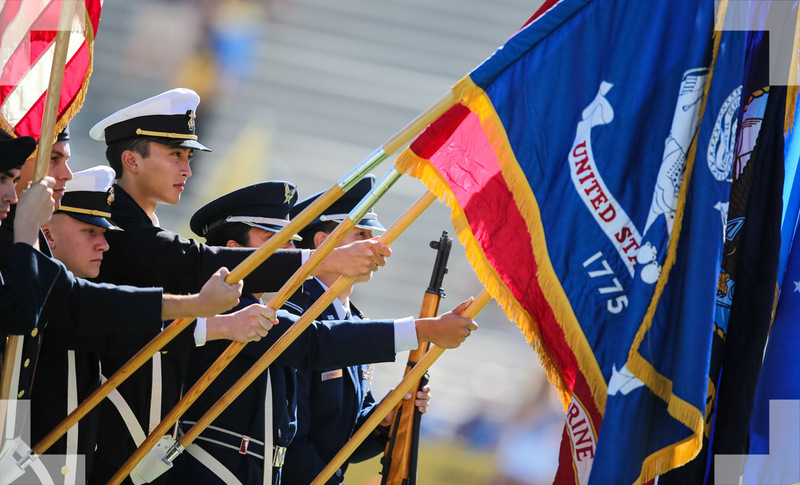 Most of the images in this blog were taken with the 600 mm. 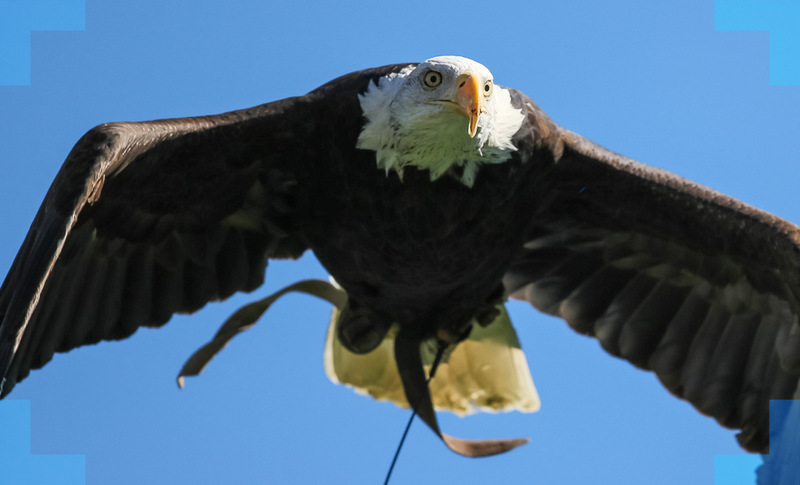 There was an eagle flyover at the beginning of the game, and it was pretty hard to track a flying bird with such a tight lens, but I got a few nice frames. 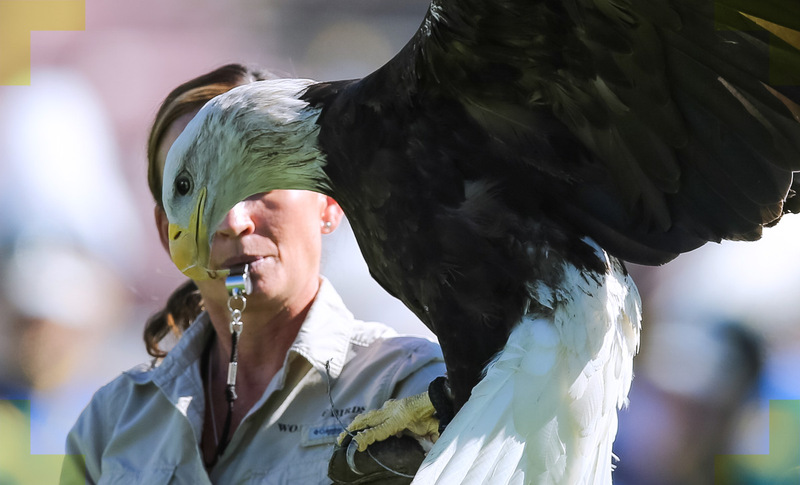 I think it was the first time I had seen a live bald eagle so close, and it was truly a majestic sight. 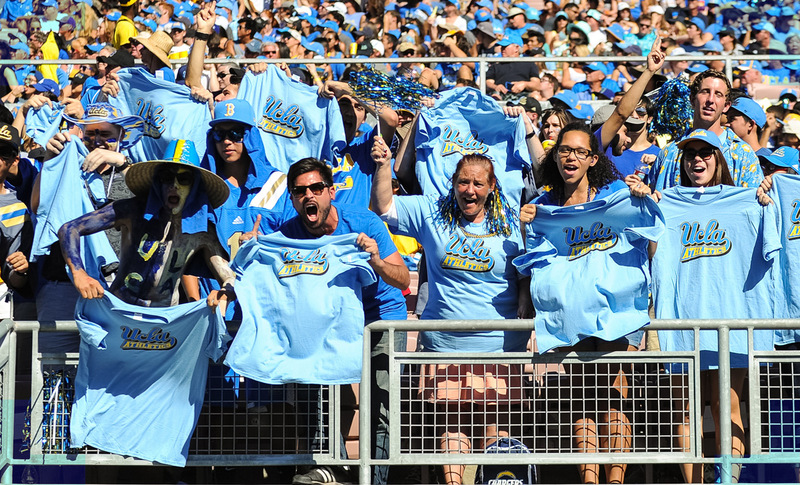 It was Halloween on the day of the matchup, so many fans were in costume. 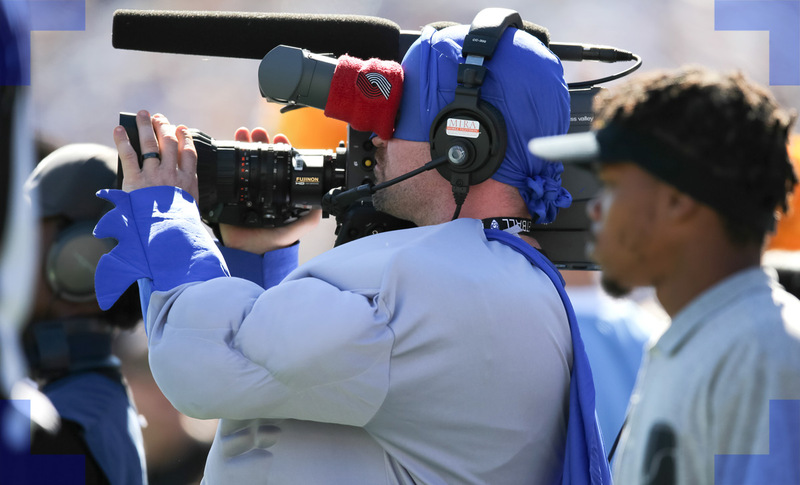 The PAC-12 camera crew were also in full costume, and it was actually pretty cool to see them get into the spirit. I have to give kudos to the guys running up and down the sidelines in the near 90-degree weather, wearing superhero outfits and full costumes. I can't say enough about the Canon 1DX camera. It is superb. 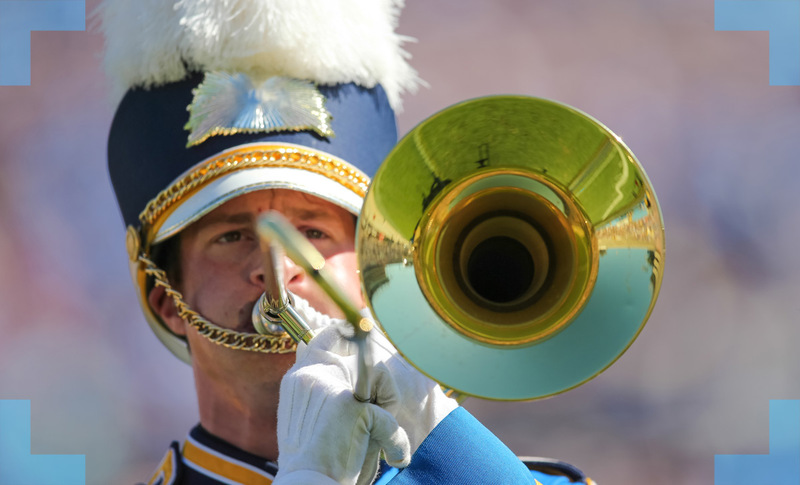 I first used it during the NFL Scouting Combine and was very happy with its performance. The photos are crisp and clean, and the auto focus is nice and zippy. It is a fantastic experience to use. 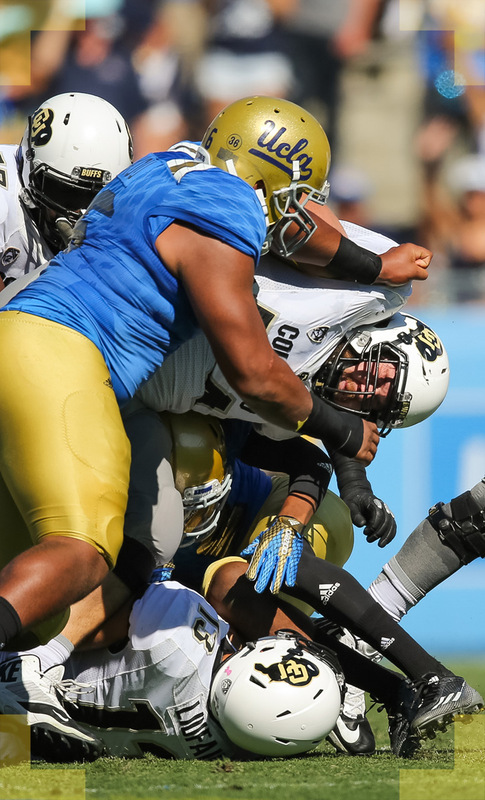 UCLA was expected to win this one handily, but Colorado gave them quite a scare. 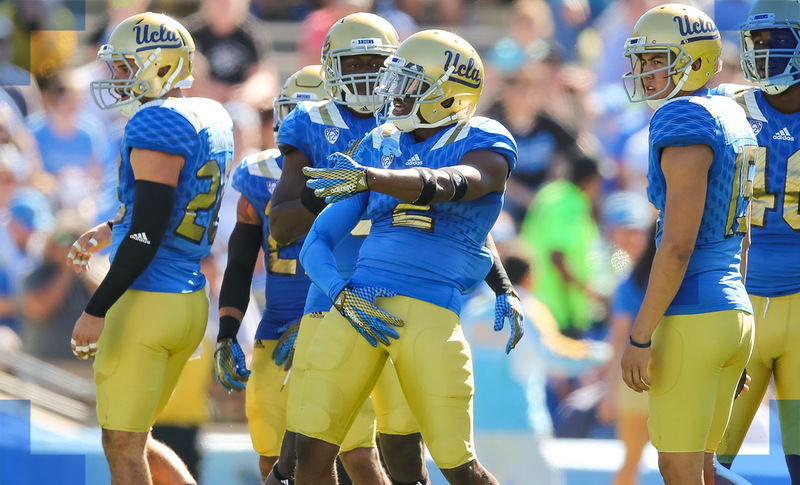 They went up late in the fourth quarter, until UCLA finally pulled away at the end. I caught many of the key plays, including the game-sealing interception. When I came into this game, I wanted to be sure I was able to capture the big plays - not just generic game action. 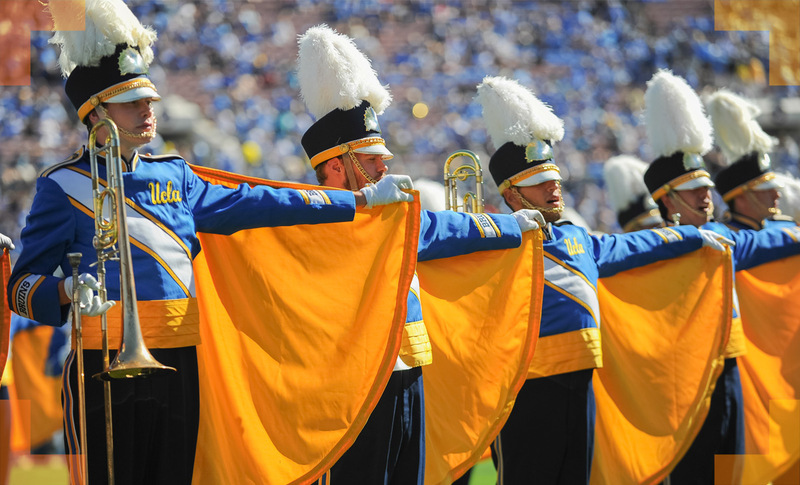 I feel a lot better about the quality of my photos compared to the last football game that I shot at USC. 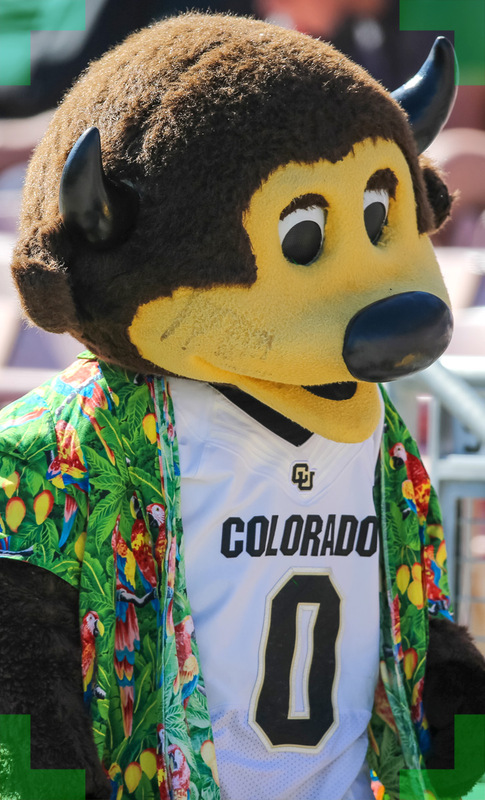 I'd like to get in at least one more NCAA football game this season. 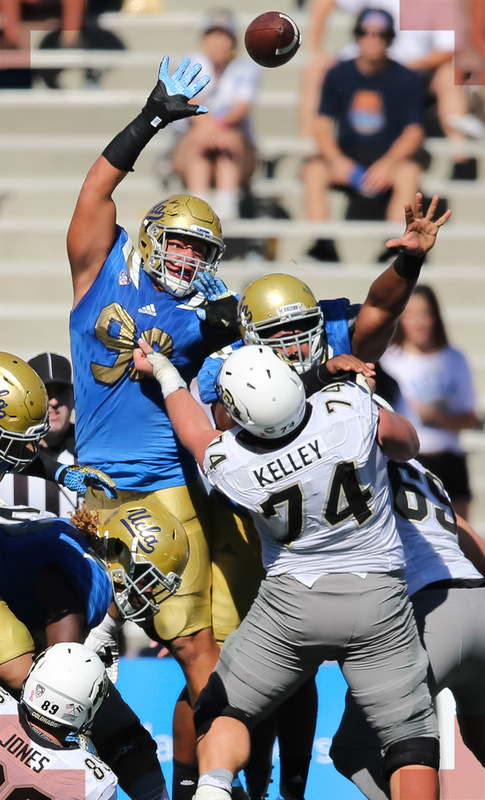 Perhaps UCLA vs USC in a few weeks? For now, enjoy the photos! 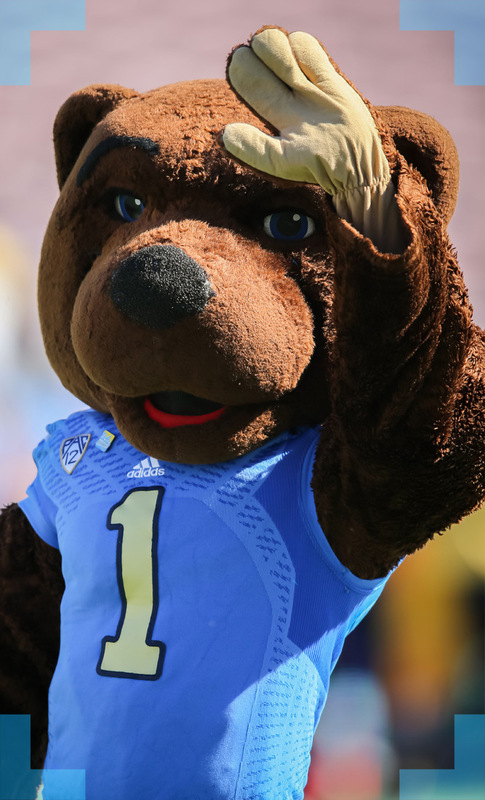 Joe Bruin greets fans before the game. Why do they always wear these things directly under their lips? Looks uncomfortable. 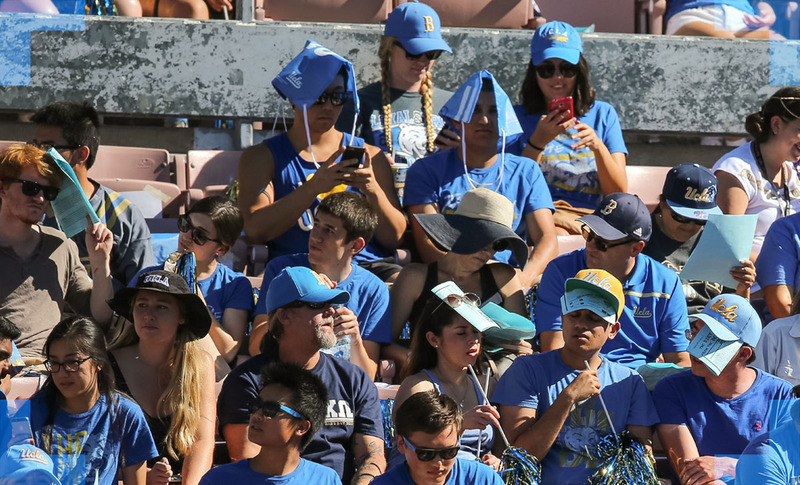 UCLA fans get creative in trying to keep cool during the hot afternoon. 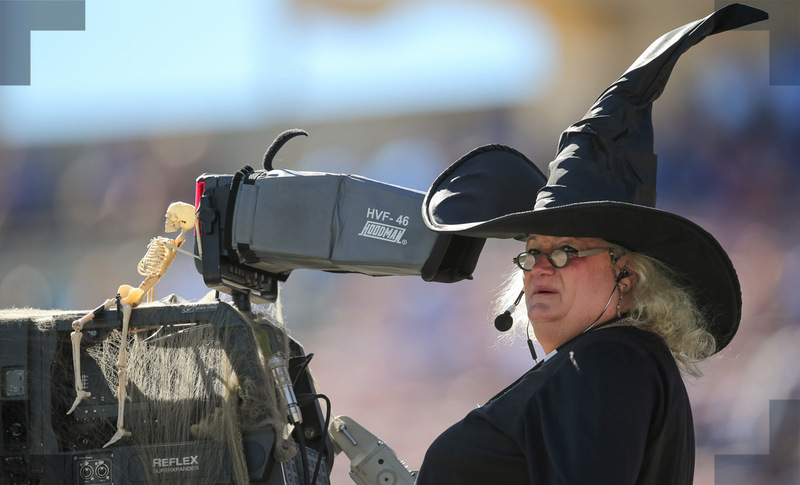 PAC-12 cameraman in full Halloween gear. 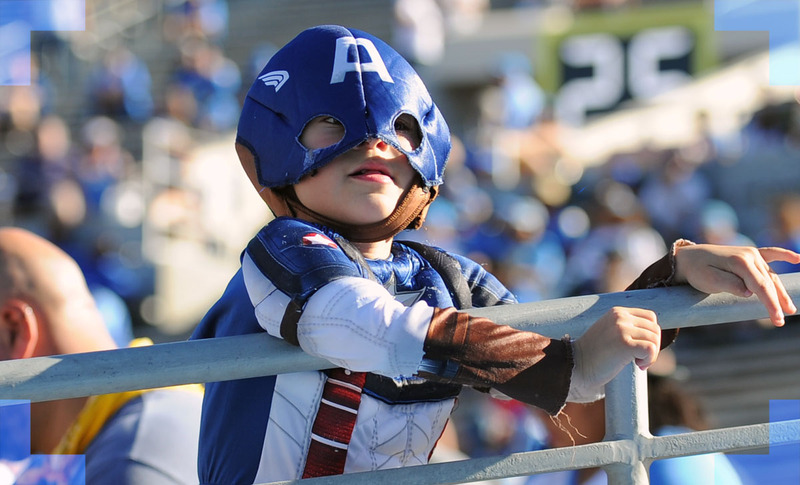 Young Captain America watches the game from the stands. 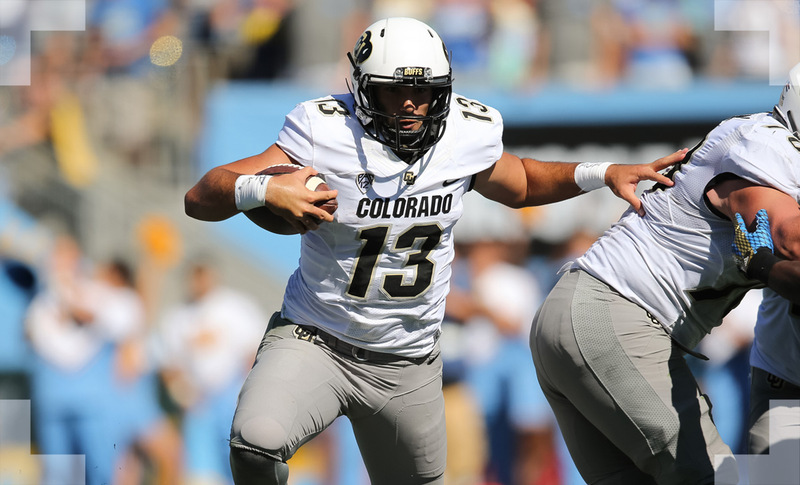 Colorado Buffaloes quarterback Sefo Liufau (13) breaks free for a gain. 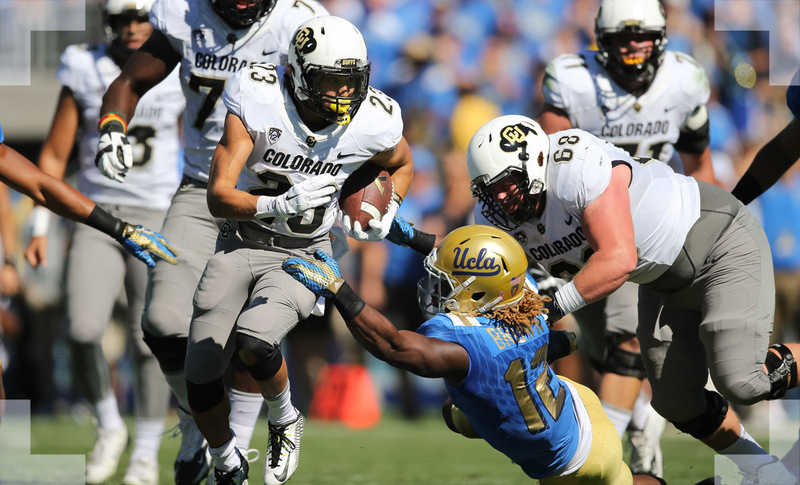 Colorado Buffaloes running back Phillip Lindsay (23) runs against UCLA Bruins linebacker Jayon Brown (12). 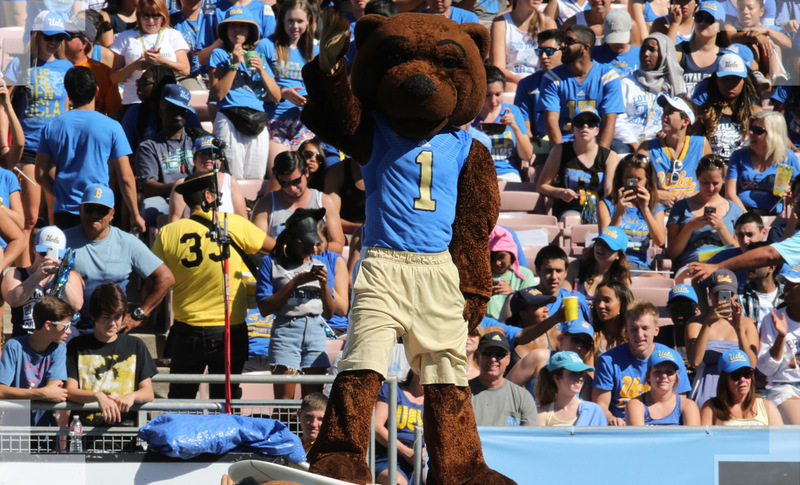 Joe Bruin surfs atop the UCLA mens' basketball team. 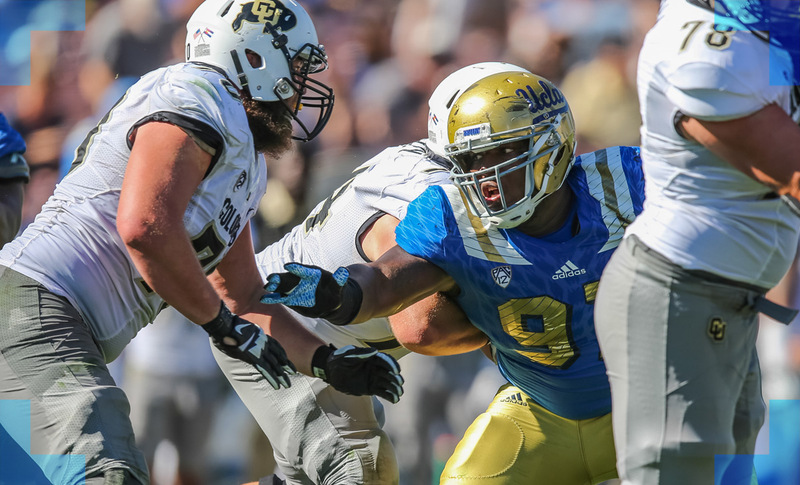 UCLA Bruins defensive lineman Kenny Clark (97) in action. 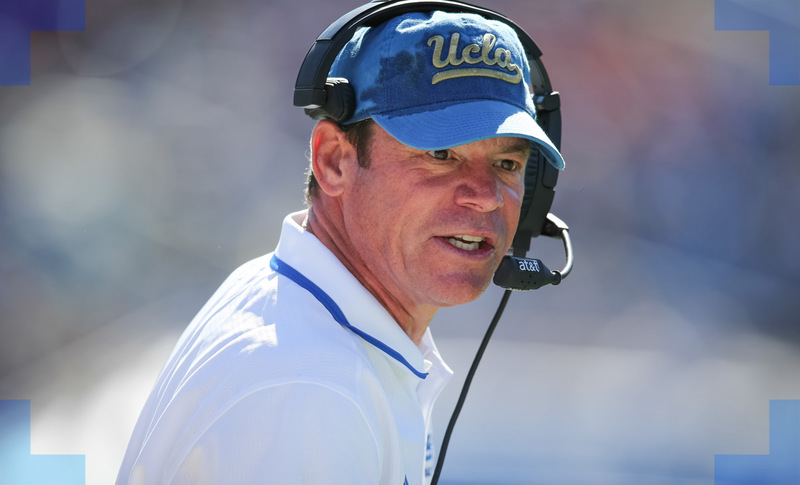 UCLA head coach Jim Mora was hot after his team gave up their first touchdown. 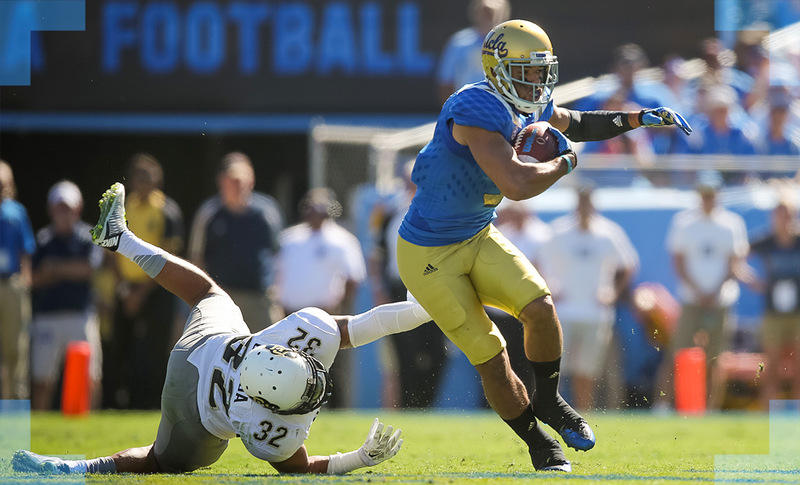 UCLA Bruins wide receiver Thomas Duarte (18) is tackled by Colorado Buffaloes linebacker Rick Gamboa (32) defensive back Jered Bell (21). 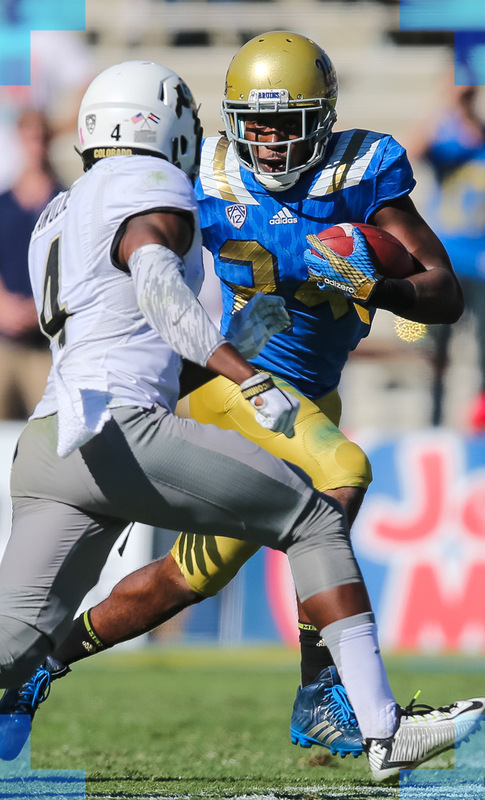 UCLA Bruins running back Paul Perkins (24) runs up the field against Colorado Buffaloes defensive back Chidobe Awuzie (4). 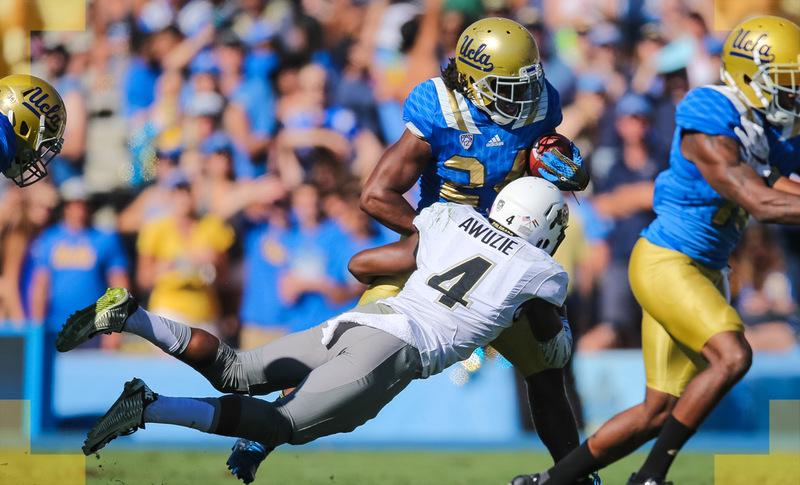 UCLA Bruins running back Paul Perkins (24) is tackled by Colorado Buffaloes defensive back Chidobe Awuzie (4). 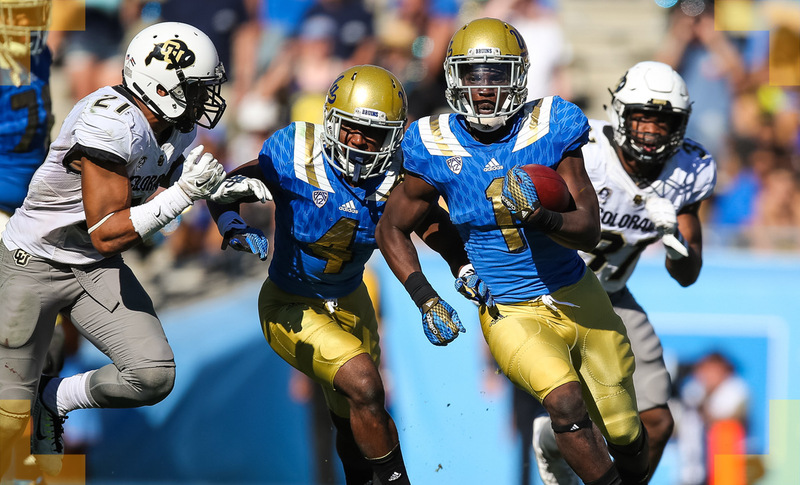 UCLA Bruins running back Soso Jamabo (1) runs up the field against Colorado. 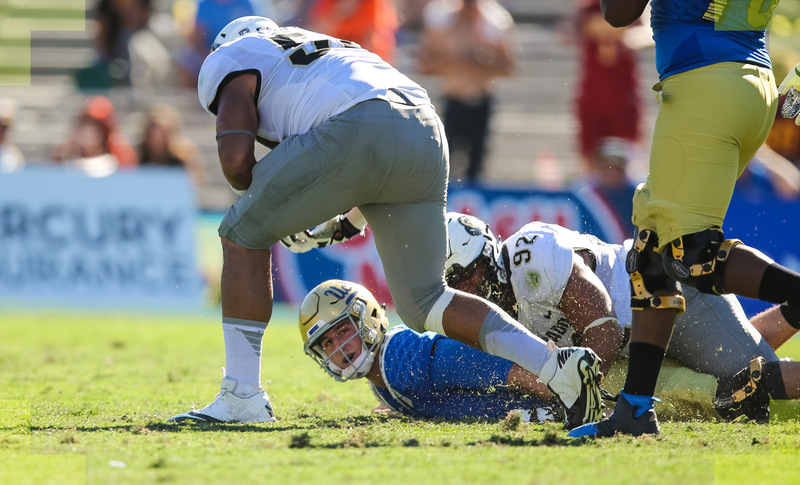 UCLA quarterback Josh Rosen (3) loses the ball on a sack. 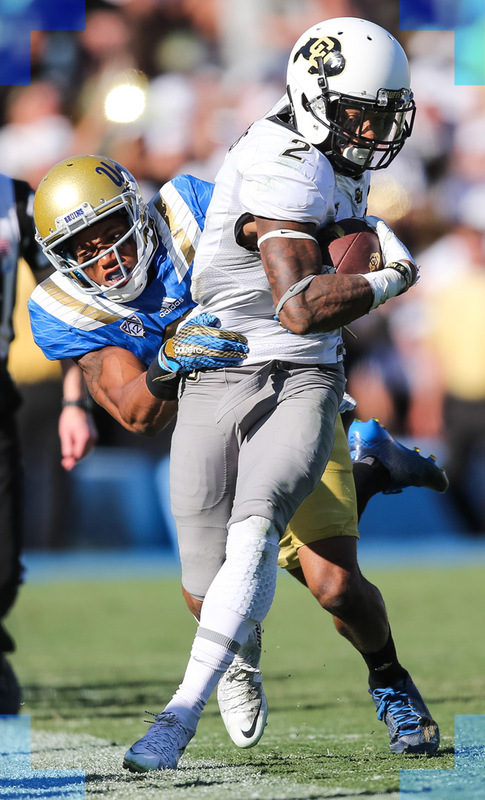 UCLA Bruins wide receiver Stephen Johnson (6) gives a stiff arm to Colorado Buffaloes defensive back Jered Bell (21). 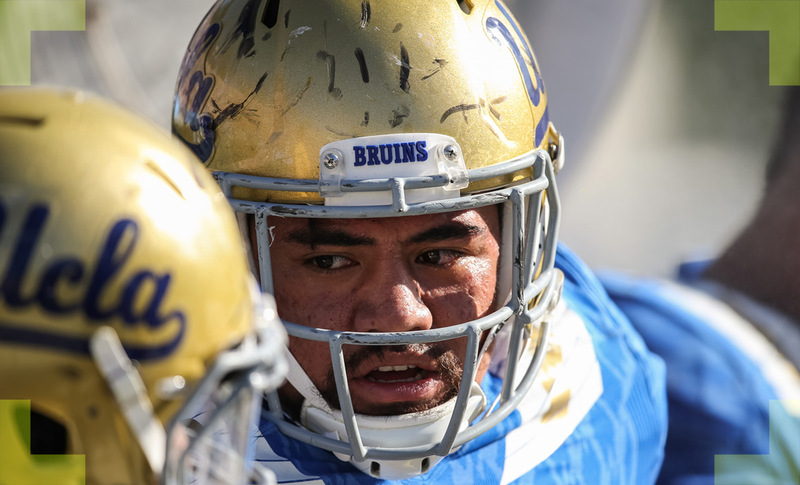 UCLA Bruins defensive lineman Jacob Tuioti-Mariner (91) looks on from the bench in a game against Colorado. 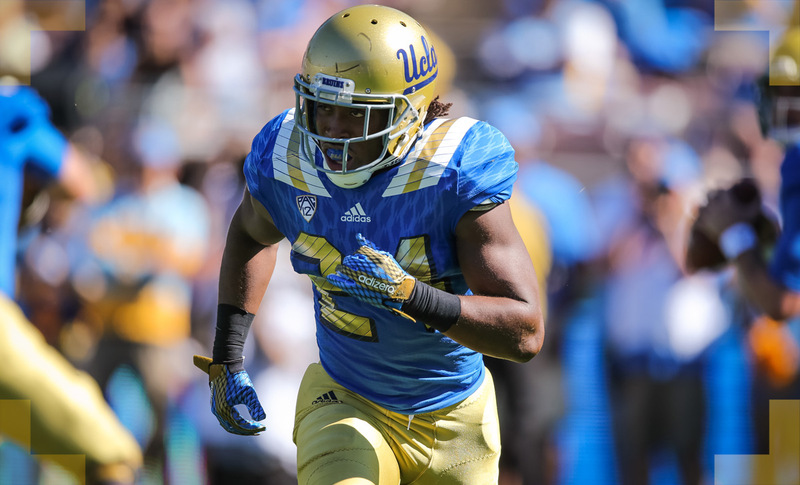 UCLA running back Paul Perkins (24) runs up the field against the Colorado Buffaloes. 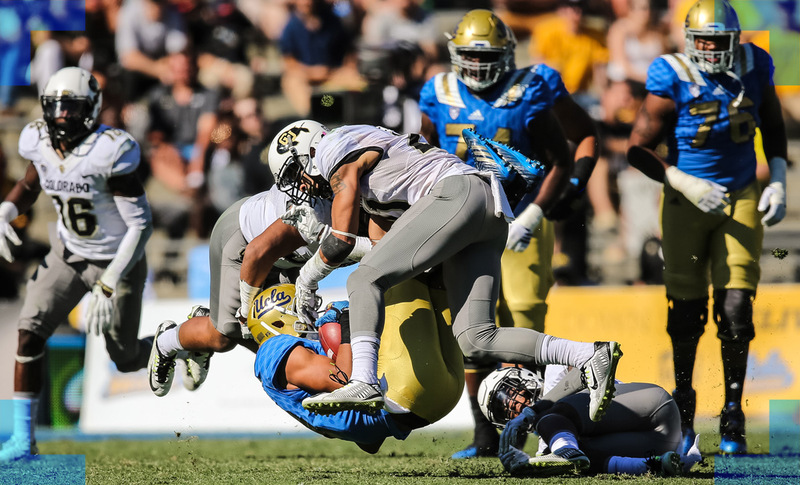 UCLA Bruins wide receiver Jordan Payton (9) breaks a tackle against Colorado Buffaloes linebacker Rick Gamboa (32). 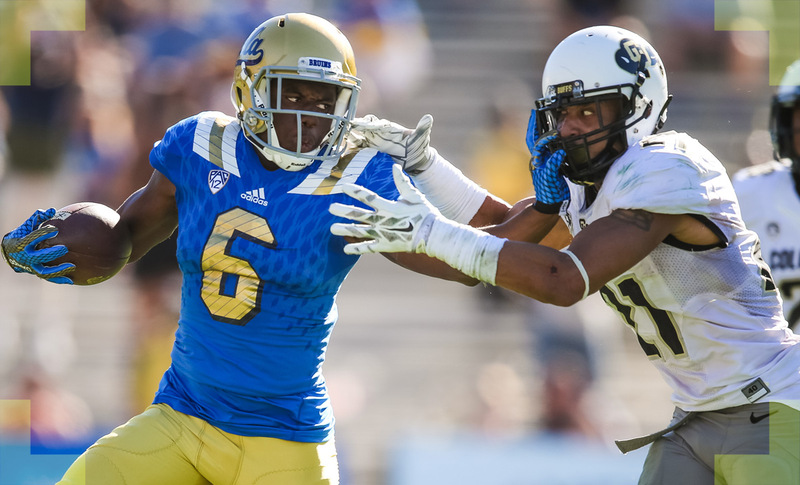 UCLA Bruins wide receiver Jordan Payton (9) runs up the field against Colorado Buffaloes defensive back Chidobe Awuzie (4). 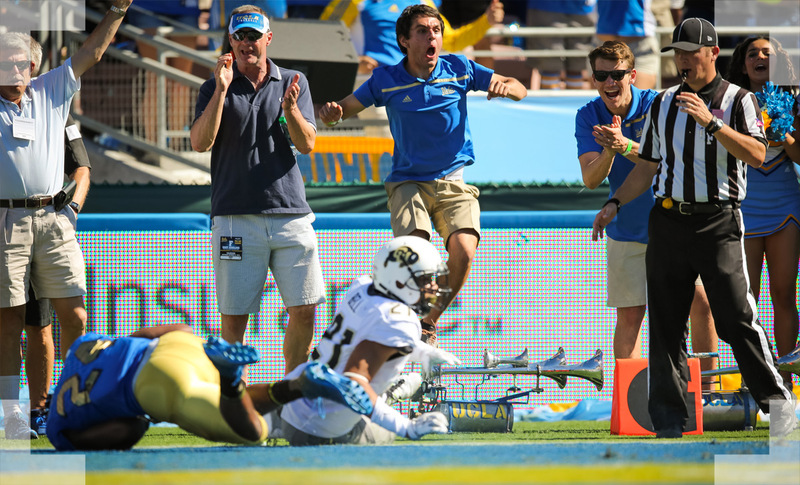 UCLA fans celebrate after watching running back Paul Perkins (24) score a touchdown in the first quarter against the Colorado Buffaloes. 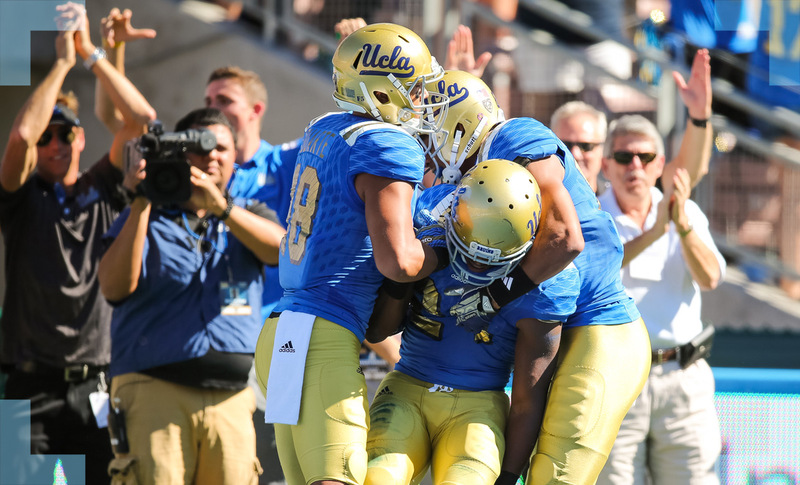 UCLA Bruins running back Paul Perkins (24) celebrates with teammates after scoring a touchdown against the Colorado Buffaloes. 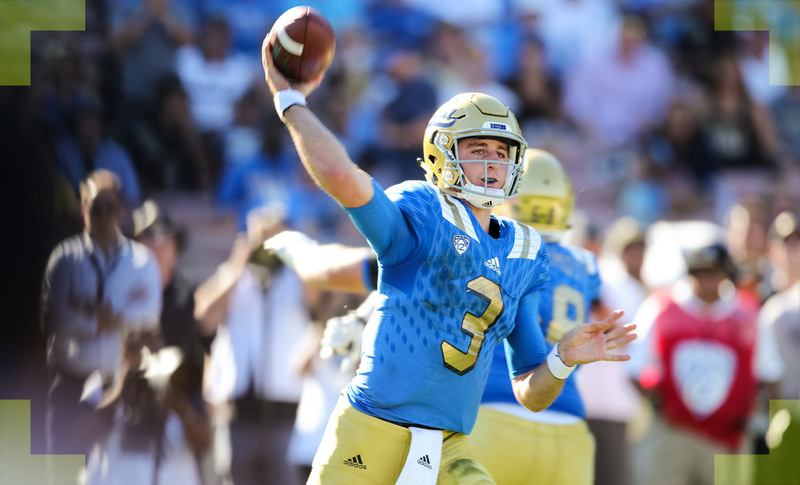 UCLA Bruins quarterback Josh Rosen (3) throws a pass. 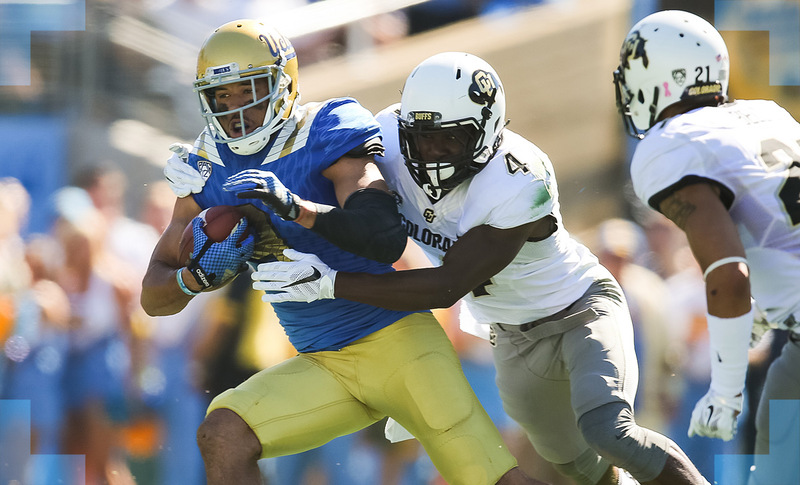 Colorado Buffaloes wide receiver Devin Ross (2) is tackled out of bounds. 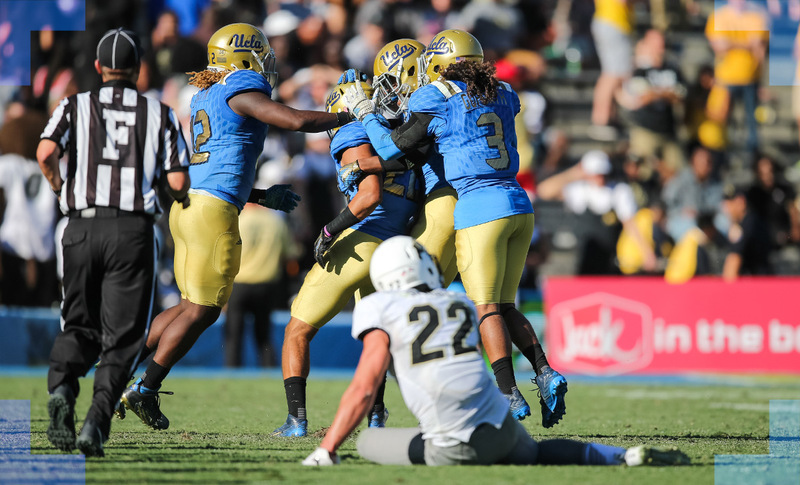 UCLA Bruins defensive back Nate Meadors (22) intercepts a pass with 51 seconds left in the fourth quarter to seal the victory over the Colorado Buffaloes. 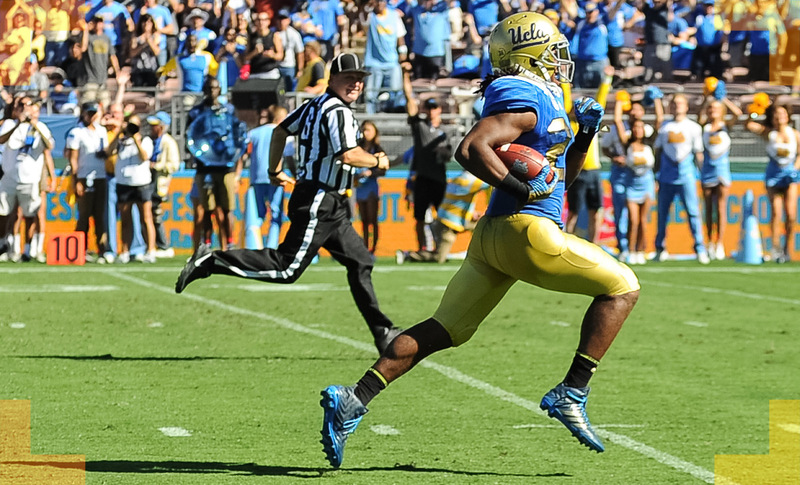 UCLA Bruins running back Paul Perkins (24) runs to paydirt. 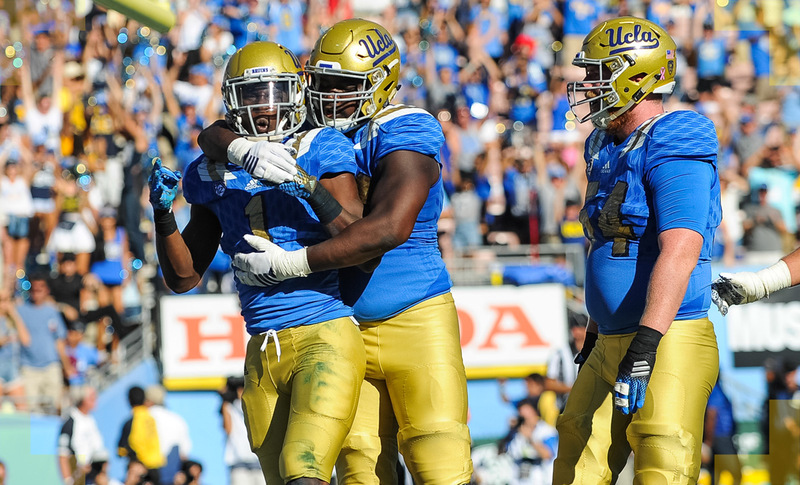 UCLA Bruins running back Soso Jamabo (1) celebrates with teammates after scoring the go-ahead touchdown in the fourth quarter. 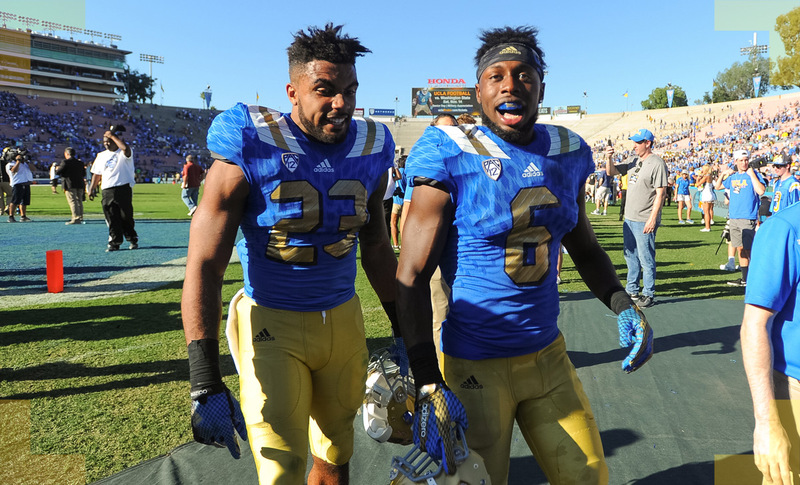 UCLA Bruins running back Nate Starks (23) and defensive Adarius Pickett (6) leave the field victorious after surviving the Colorado Buffaloes. 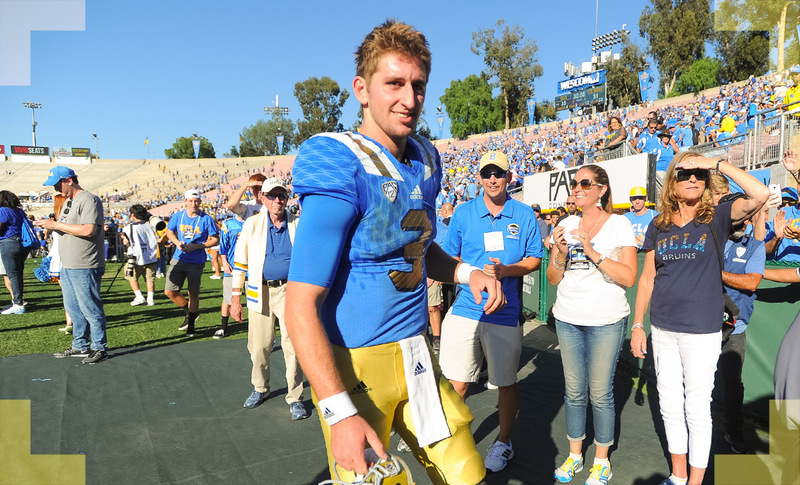 UCLA quarterback Josh Rosen (3) walks off the field after helping his team defeat the Colorado Buffaloes at the Rose Bowl.